Based on the fact that most of these are probably not just rumor at this point, I am going to put in my two cents on what I like on paper and what I think might be an issue. I am going to cover this more in depth in a podcast coming out soon. 30 megapixels is more than enough for most applications, so I don't see any need to complain here. Honestly, I actually applaud them for not trying to go for 40 or 50. I think that will help keep noise down. They are claiming it has 5,655 AF points. So that is pretty much the whole screen and is welcome. I am sure you will be able to choose how many you want to be active as this would be a must for fast action photography. I know that Canon is going to get kick back from photographers on only having 4K at 30p, but I still think this is a good offering on their first mirrorless targeting advanced photographers. Hopefully it will not be a crop like it is on the Canon 5D Mark IV. Some images suggest that it has a fully articulating screen. This is going to be huge for vloggers and shooting from low angles. Only 660 grams compared to 910 grams of the 7D Mark II. All you weight snobs should be happy about that. Personally, the camera is always the lightest part of the equation in wildlife photography, so I don't worry about it. Only 8 frames per second, but that is more than enough for wildlife photography. 8fps or above is the sweet spot for action work. That's really all I have to say for now on this topic. We really need to wait a bit longer to see how everything shakes out. This is indeed exciting news as Canon moves into the new era of photography! After reviewing the Canon EF 300mm f4 IS USM, I felt like it was time to take it up a notch and review a lens that is really at the top of the Canon lineup for sports and wildlife. This lens has been engineered with the most discerning photographers in mind. Some might even say the Canon EF 400 2.8 II is the best telephoto lens Canon has ever made. Because this may be the "baddest" lens Canon has ever made, I vowed put this test through its paces. From initial impressions to micro focus calibration to field work, I wanted to see if this lens really was the best. Of course there are several other lenses which are famous for being amazing lenses in the telephoto "L" lens lineup. Among the best are the EF 500 f4 L, the EF 600 f4 L and the EF 200-400 L. Make no mistake, I will not let lenses in this price category and fame get by with anything! As with my other reviews, I will be holding this lens up against the modestly priced, but highly effective Sigma 150-600 C. Since I shoot with this lens on a weekly basis, I am thoroughly familiar with all the pros and cons this lens has dealt out. Will the 400 2.8 really blow away the Sigma? Read on to find out! Image Stabilized - Mode 1 Stabilizes X and Y axis. Mode 2 Stabilizes during horizontal and vertical panning. Provides roughly 4 stops of image stabilization. Mode 3 detects which axes to stabilize and only stabilizes at the time the images is taken. There is no preview. I think a big mistake some reviewers make is not micro-adjusting the lens to the camera. 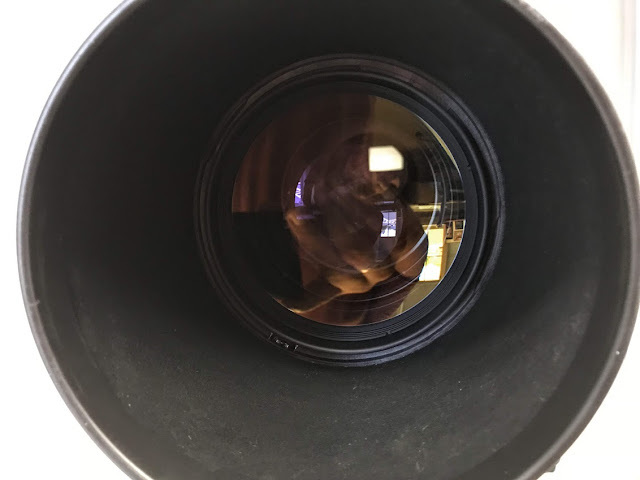 How can you sincerely test the lens in the field without making sure the auto-focus of the camera is calibrated to the lens? I figured this lens would be spot on when calibrated to my Canon 7D Mark II, but it was not. I ended up making a -2 adjustment in order to get it perfectly in focus. Below is the actual final calibration shot. Canon began manufacturing of the 400 around 2010, and it was officially released in August 2011. It was an upgrade to it's sister lens the Canon EF 400 f2.8 L IS USM. The latter no longer being in production. The first word that comes to mind when looking at the build of this lens is "WOW!" The engineers set out to produce an astounding lens and they met their goals with breath taking precision. From the moment I opened the box, I knew I was viewing an unusual product. The most obvious and striking feature when viewing the lens from any distance, is the large diameter of the front elements. This accounts for the majority of the weight of this lens and also the extreme cost. Having a front element this large is amazing, but it is also a target for all manner of possible ways to get damaged. The more surface area of glass on the front, the easier it is to scratch and the more front heavy it becomes. 8.4 lbs is no joke! It weighs more than the average new born baby and lugging this around all day is likely to be taxing on the body. At the rear of the lens are are myriad of buttons and switches. There are some you would be familiar with such as the image stabilization switch and some you may not be. Since this is the best of the best, it comes with a few more bells and whistles that are worth explaining throughout this review. Included among the controls is a new button to me, the focus preset "Set" button. That's right, you can set a pre-focus area and return to it over and over again. More on that later. As with most Canon L lenses, the manual focus ring is a good size and smooth to operate. At the rear of the lens, is a drop in filter holder. This allows you to drop a smaller filter into the rear of the lens. With a massive front element, buying a filter that big would be difficult if not impossible. I really wish all telephotos had this feature, but I can see the difficulty this would introduce into the manufacturing process. So it can't all be roses, right? Well, yes, there are a couple drawbacks on the build with this lens. First, the lens hood is so massive that it was actually difficult for me to push the lens through the opening in my blind's camo netting. In small spaces look to be a bit frustrated by this design. The other obvious issue is the weight of this lens. Because of the 8.4 lb weight, it is almost impossible to lug this 4 miles through rugged terrain. 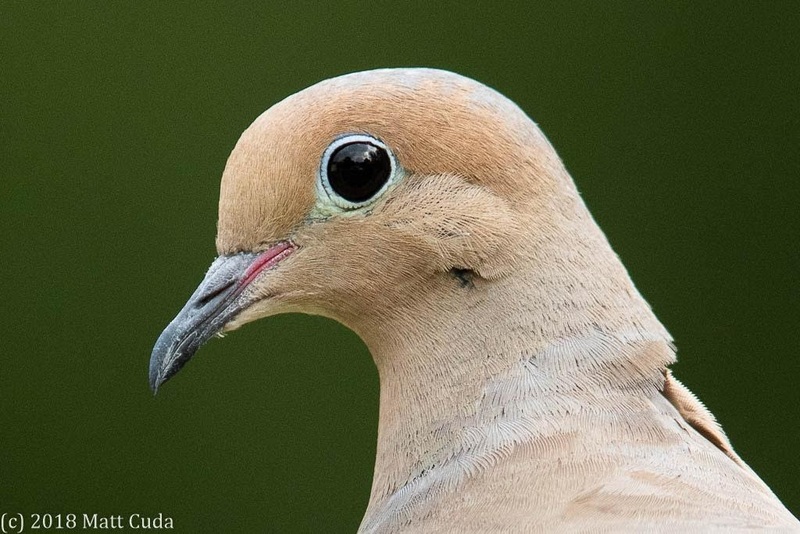 If you are thinking about this lens as your primary wildlife lens, I would recommend against it. 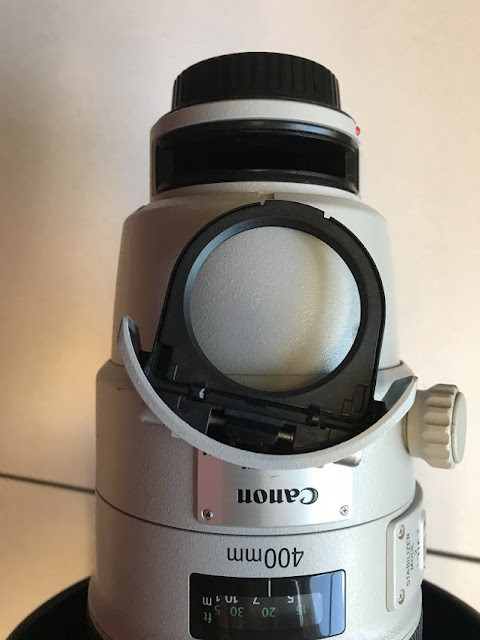 Finally, when the lens arrived to me, the hood was actually stuck on the lens. I was able to loosen it up, but eventually the little knob to tighten down the lens hood stuck in the open position. At that point, I had to wedge a piece of cardboard between the hood and the lens to keep the lens hood from falling off. Now, I want to ask you. Should a $10,000.00 lens have a fault in the lens hood knob? After researching it online, I found it was a fairly common problem with this lens and the other big Canon primes. This is not something you want to find out after spending this kind of cash on a lens. What you are not going to find in this review is a sharpness test pointing at some lens chart. There are plenty of those available on the web. What you are going to see is how this lens performs against real subjects. 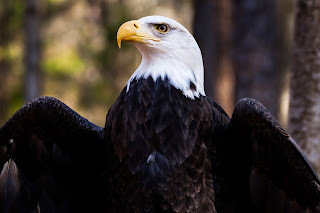 My working genre in the photography world is wildlife and I specialize in bird photography. So that is where I will concentrate my tests. Always stick with what you know when testing a lens. When I began testing this lens sharpness, I knew it was going to be very sharp. This lens is well known for its sharpness and speed of focus. Because of that, were I decided to spend all my time was comparing this lens with my Sigma 150-600. I wanted to answer the question, "Is this lens' sharpness worth almost $10,000 US? I honestly believe that as photographers on a budget, we owe it to ourselves to find out what makes a 10K lens a 10K lens. Even if most of us never buy this lens, we need to answer that question. Indeed the lens was sharper than my Sigma 150-600, but I did not feel like the difference in sharpness was worth spending that kind of money. 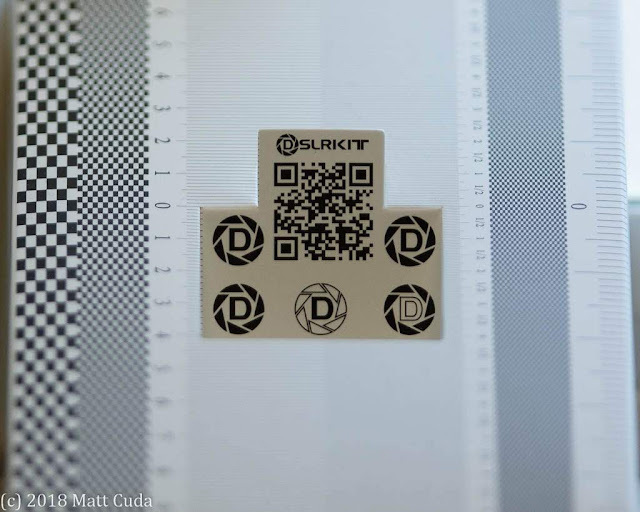 With modern post processing software, the sharpness difference can easily be compensated for. Don't forget, I could buy 10 of the Sigma lenses for the price of one Canon 400 2.8 II. However, if price is not an issue for you, then you will be getting a very sharp lens with plenty of resolution. Below is a 100% crop of a mourning dove with default sharpening applied. I could definitely see where there was more resolution provided by this lens when compared to other lenses I have photographed with. In the above 100% crop, the beak details were quite amazing. 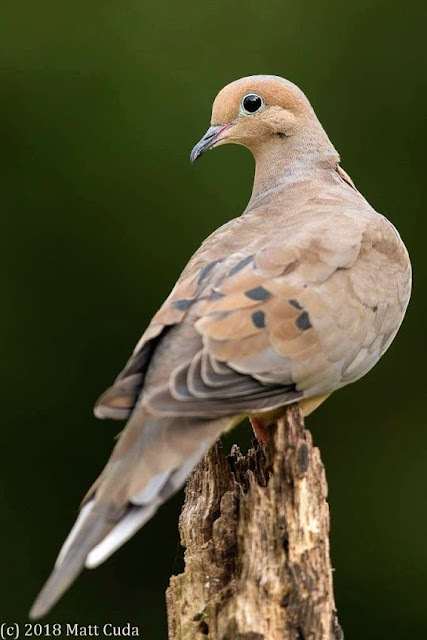 Below, I have a fully processed image of the mourning dove with added clarity, sharpening, contrast and noise reduction. Out of the gate, this lens is a thoroughbred. It can focus faster and better than any other lens I have ever used. This is due, for the most part, in thanks to the large front element gathering light at f2.8. It is a light sucking hog and that is exactly what your DSLR's AF sensor is hungry for. Having said that, for basic action, I don't think you need a lens of this caliber. If you are making a living as a sports photographer, then a lens like this will make a difference in what is in focus and what is not. Personally, as far as wildlife, I thought this lens was overkill and I really don't think that is what Canon designed this lens for, specifically. My feeling and the feeling of others was this lens was designed for fast action sports photography for the discerning professional. It is heavy and was designed to be put on a monopod at a baseball or football game. With my backyard birds, I didn't feel like it snapped into focus any faster than my Sigma, but it did focus faster when using AI servo. The incremental focusing done in this mode was so fast, that it made a totally different noise as the focus motor zipped back and forth finding focus as the birds moved their heads and bodies. Had I taken this out for birds in flight photography, I believe it would have been a stellar lens. With the weight of this lens though, I honestly didn't feel like lugging this up to Pilot Mountain. 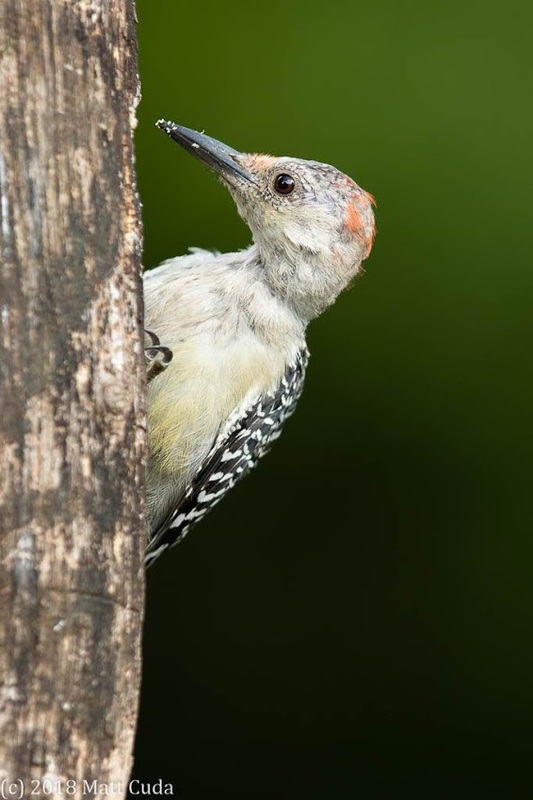 One of the subjects I photographed during testing was the red-bellied woodpecker. Woodpeckers are very agile and difficult to focus on. The 400 did a great job of keeping up with the woodpecker's bobbing head. I felt like it did a better job than my Sigma here. Note that this time of year is terrible for photographing songbirds. This is their time to molt, and this poor female red-bellied woodpecker has lost a great deal of her head feathers. In case I didn't mention this several times already, let me say it again. 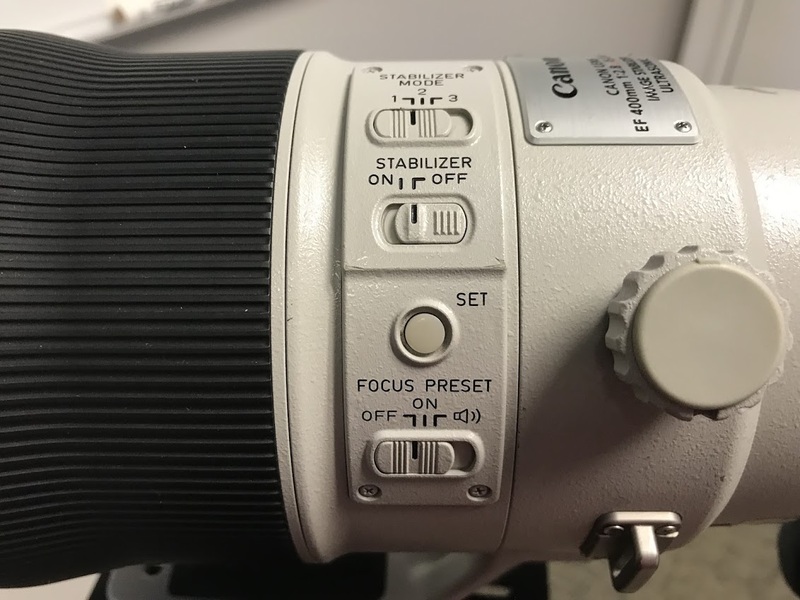 This lens has all the bells and whistles and so I was not surprised to see three different modes of image stabilization. That's right, not two modes, but three modes! Mode 1 - This is the traditional IS mode which stabilizes both the vertical and horizontal axes. Mode 2- This is also a traditional IS mode which only stabilizes the vertical axis. This is used for panning purposes. Mode 3 - This mode is new and will only stabilize the lens when the shutter button pressed all the way down and at the time of taking the image. It does not "preview" the stabilization in the view finder. This mode is more effective when shooting action. My Sigma 150-600 also has the Mode 3 feature, but it is not a switch. It is configured through the doc. You can choose whether you want to preview the IS or let it lock it down at the moment of taking the photo. So I can not say that this is a great win for Canon, although with Canon it is immediately available with a switch. So maybe a slight advantage from that perspective. Among the other switches near the image stabilizer switches is the focus preset switches. When the focus preset function is engaged, the photographer can focus on a particular area in the image and make it a focus preset. This is primarily useful for sports photographers who are shooting in a particular zone on a ball field. Again, one of the most obvious uses of this lens is professional sports photography. I would say that it should be exclusively used by this group, but I think that would be short sighted. As a secondary use, I could see this used for wildlife photography. Specifically as a go to lens for low light, flight photography or blind photography. I think its strengths would be best utilized in a stationary manner. From a car, a popup blind, or on a sturdy tripod with a gimbal head you would have a killer setup. I can see pairing this with the Canon 7D Mark II to give you a 640mm effective focal length. However, I do not see this as a run and gun lens. 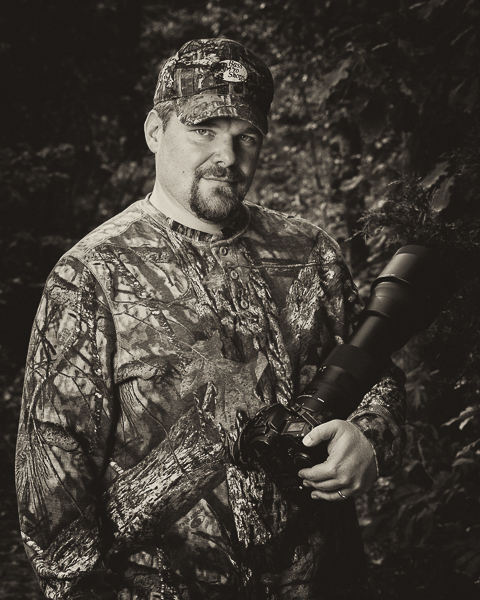 If your style is moving stealthily through the woods and using cover and concealment as you move, this lens will be heavy and with the big white lens hood, will give away your position. If you insist on using this lens in this type of setup, consider buying a lens coat and a gym membership. Obviously from a technical perspective this lens is going to work extremely well for you. It has amazing auto-focus, amazing build quality and at 400 mm can handle most of your wildlife and sports photography needs. However, and this is a BIG however; is this lens the best choice for you? Big features make for a heavy and expensive lens. There is a reason that many photographers opt for the 300 2.8 instead of the 400 and that is simply the raw economy of the matter. 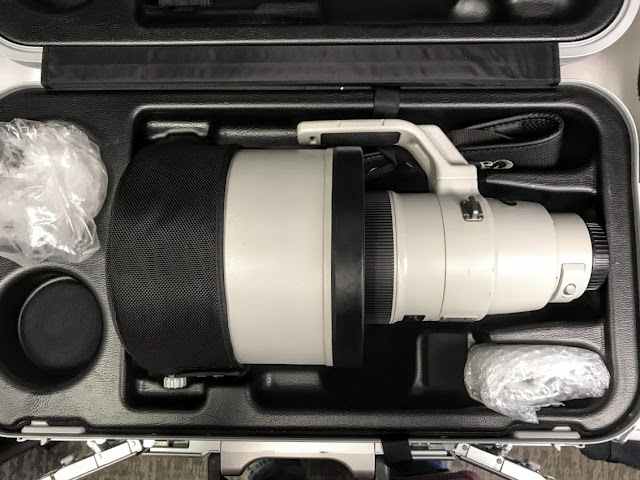 On the used market, I can pick up a Canon EF 300mm 2.8 IS for only $5,000. Furthermore, since the 300 is so sharp, I can put a 1.4x teleconverter on the lens. For a few hundred dollars more, I have an f4, 420mm effective focal length. 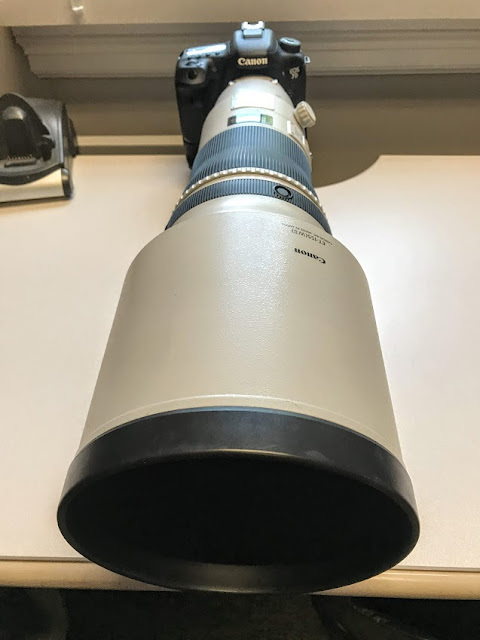 Or, how about a 2x teleconverter giving you a whopping 600mm effective focal length. There are also other third party options which also bear mentioning here. How about the Sigma 120-300 2.8? A sharp and more versatile lens which also supports using a teleconverter. This lens is only $3,313 US. With the money saved, you can take a trip to Alaska to photograph brown bears and eagles. It used to be that the major manufacturers were the only companies that frankly could make the glass needed by semi-pros or pros, but those days no longer exist. Today, the 3rd party lens making world is growing rapidly and producing some astounding glass. They are turning the heads of even the most discerning professional. Finally, I think Canon needs to understand the changing world of photography. No longer do professional photographers make the money they need to purchase a lens for $10,000. We are expected to do a whole lot more with a whole lot less money. The days of newspapers owning a couple 400mm 2.8 lenses are gone along with the large staffs of in house photojournalists. Having said all that. You are in control of your own destiny. If you have the extra money, than by all means go for it. Buy that EF 400mm lens! You will not be disappointed. Large, clunky lens hood with a problematic tightening knob. Check out the accompanying video for this review!